The new model OES thermostats of our KIRPART factory are in our stock. KARSAN original spare part dealership has started. Karland as the distributor of internationally well-known brands ( FAG, GATES, INA, SKF, TIMKEN) provides bearings and belts to his customers. 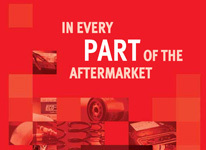 Karland, provides his clients; CAPA, TUV, ISO, CENTRO ZARAGOZA and THATCHAM approved products as “Equivalent Parts ". Karland, provides his clients ISO 9002 and QS 9000 approved engine parts. Karland, provides his clients with ISO 9002 and QS 9000 approved products. Karland, provides his clients ISO 9002, QS 9000 and/or ISO 16949 approved parts.